Saturday Surprise — Oops — On Sunday — Again. Good Morning, and welcome to Saturday Surprise on Sunday! Time just goes too fast for me, and I keep letting Saturday sneak up on me without realizing it has done so. But that’s okay … we can have just as much fun on a Sunday morning, yes? I hope you are all having a lovely weekend! 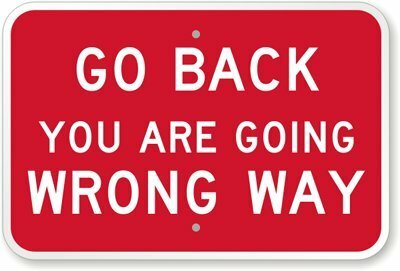 Recently, I was having a discussion with one of my UK friends, and I truly do not remember why the topic even came up, but I mentioned something about them driving on the ‘wrong’ side of the road. He, of course, suggested that I simply call it the ‘other side’ of the road, for who’s to say which is right and which is wrong. So, of course, that opened the lid to my curiosity box, and I had, suddenly, a burning desire to know how it came to be that we here in the U.S. drive on the right side, and the Brits drive on the wrong left side. And it turns out to be rather a fun story, so I thought it would make a nice Saturday Sunday morning diversion. It turns out that driving on the left side dates back to the days of feudal societies. 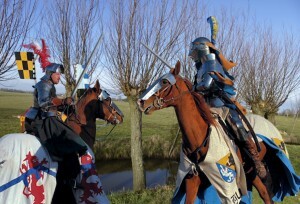 Yes, yes, I am aware that Karl Benz and Henry Ford had not yet invented the automobile, but they rode horses (not Karl & Henry, but just people in general), and since most people are right-handed, swordsmen preferred to keep to the left in order to have their right arm nearer to an opponent and their scabbard further from him. So that’s a fairly logical explanation for the left side, but how did some of us come to switch to the right side? 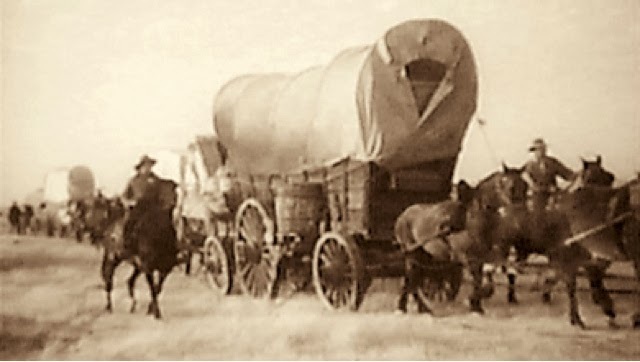 In the late 1700s teamsters in France and the United States began hauling farm products in big wagons pulled by several pairs of horses. These wagons had no driver’s seat; instead the driver sat on the left rear horse, so he could keep his right arm free to lash the team. Since he was sitting on the left, he naturally wanted everybody to pass on the left so he could look down and make sure he kept clear of the oncoming wagon’s wheels. Therefore, he kept to the right side of the road. Additionally, in France, until the French Revolution in 1789, the aristocracy travelled on the left of the road, forcing the peasantry over to the right, but after the storming of the Bastille and the subsequent events, aristocrats preferred to keep a low profile and joined the peasants on the right. Then when Napoleon began conquering other nations, the habit of driving on the right extended to other nations such as Belgium, the Netherlands, Luxembourg, Switzerland, Germany, Poland and many parts of Spain and Italy. The states that had resisted Napoleon kept left – Britain, the Austro-Hungarian Empire and Portugal. Although by the 1800s, the trend was leaning toward driving on the right, Britain not only repudiated it, but in 1835 made left-hand driving mandatory, and the countries that were part of the British Empire followed suit. In the early years of the English colonization of North America, driving on the left was the norm. But once the U.S. gained its independence, just like the child finally freed from the bonds of its parents’ rules, that quickly began to change, and Pennsylvania was the first state, in 1792, to pass a law making driving on the right mandatory. And if you really want something confusing … Spain had no traffic regulations prior to the 1930s … some drove on the left, some on the right. In the 1960s, Great Britain also considered changing, but the country’s conservative powers did everything they could to nip the proposal in the bud. Furthermore, the fact that it would cost billions of pounds to change everything round was not much of an incentive… Eventually, Britain dropped the idea. Today, only four European countries still drive on the left: the United Kingdom, Ireland, Cyprus and Malta. 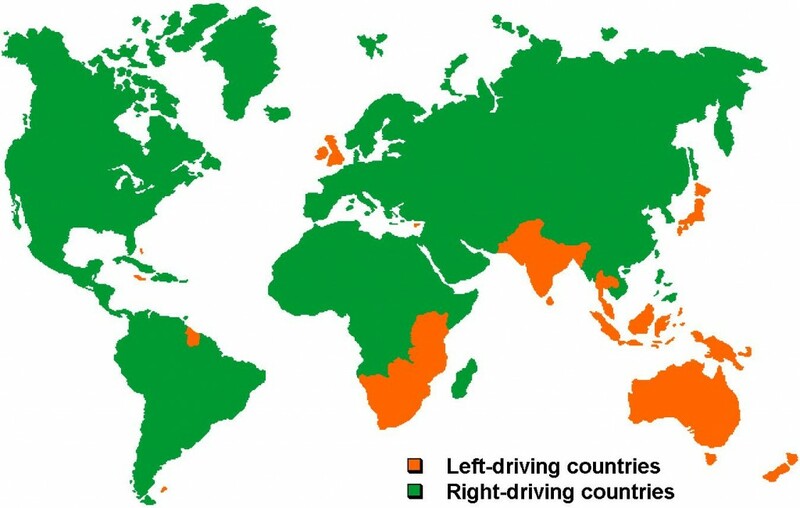 Currently there are 166 countries that drive on the right, compared to 74 countries that drive on the wrong left. Which do you suppose is safer? I rather doubt that safety has as much to do with side of the road as it does with fitness of the drivers, but world standards has put together an interesting infographic to try to tie it down. And now, folks, your burning question about who drives on which side of the road and why, has been answered. Go enjoy your weekend (what’s left of it), fire up the charcoal grill, invite a few friends over and relax, for tomorrow is … well, you know. This one’s for you, Keith! This entry was tagged driving rules, French Revolution, Henry Ford, Karl Benz, knights, right or left, UK vs US, which side of the road. Bookmark the permalink. Oh dear, I couldn’t read the statistics on my tiny phone, but no matter; all driving is banger these days with the exponential increase in traffic! We are driving a left hand road UK car in Spain, so it makes road visibility for the driver a bit of a nightmare. And we try to stay stress free in vain! Hopefully we stay safe…not even a phone signal up here and the nearest Spanish neighbour is a mile away! A (sausage) Banger, may have originated from the fact that unless the casein skin of a sausage (used to be sheep intestines), is pricked before cooking, the sausage will explode! An ‘Old Banger,’ may originate from the word ‘Charabang’ …the English form of ‘Charabanc;’ the French word for a horse drawn bus to carry a lot of passengers, later motorised. Ah yes, how could I have forgotten??? Bangers and mash … and let us not forget mushy peas!!! Oh MY!!! I’m not sure if it sounds idyllic or nightmarish! I think idyllic all except for the road/driving! Keep safe … send me some pictures!!! Are you pet-sitting up there? Hopefully there is little traffic on that road … what happens if you meet up with another car going the opposite direction? Somebody has to back up? Enjoy your peace and quiet, my friend! This is one of the official links for the Alpujarras region. It is idyllic with lots of alternative types living here amongst traditional Spanish farmers. The homes (including the one I am in) are flat roofed stone cottages and houses. All are painted white and protected (no alterations) to keep their centuries old appearance. In ours, the wooden ceiling beams are hundreds of years old. The lath and canes above them (that form the ceiling) are disintegrating and likely full of ‘death watch beetle,’ if the constant ‘ticking’ noise is anything to go by. It is quaint though. We haven’t seen the mountain goats on the 14 hectares of almond tree land maintained by the owners here, but we have seen many birds, including eagles and we are currently feeding a fox (caught on a wildlife cam) in order to keep it away from the owners chickens. Our other charges, are three outside cats (kept to keep mice populations down). We also have a 1 acre Vegetable garden to maintain. We are here for a month, but have very limited internet, (our only form of communication), brought in by satellite. The nearest town is Orgiva and 30 minutes drive away. If anyone is interested in this idyllic place, do read ‘Driving over Lemons,’ by Chris Stewart (an ex drummer from Genesis. We drink mountain spring water from the fuente (fountain) and eat the fresh organic produce from the garden. We have also attended a fermenting course and learned how to make sauerkraut, salsa, and how to grow kefir grains. My husbands Vegan Lasagne at the potluck lunch was a huge success. Do I sound happy? Yes, it is very relaxing and a beautiful place, but it isn’t for the unadventurous. The small tracks are a challenge. Most here have four wheel drive vehicles. Passing requires one vehicle to back up to where there might be a small area big enough for two vehicles. The paved roads are OK, but very winding. The house runs only on solar power and bottled gas, (and woodstoves). Everything must be monitored and nothing wasted (including the spring water. This is about as self sustainable as possible and requires foregoing things that most people think as necessities… Washing Machine- No. Hairdryer- No. Blender or Food Processor-No. Satellite TV- limited to sunny days (We don’t watch it anyway). There is no infrastructure, no one to complain to if the road washes away, and no one to take away the garbage or deliver the mail. Any landslips are generally dealt with by the local farmers and everyone pulling together. Wow! It almost sounds like a whole ‘nother world! It sounds idyllic, but I don’t think I could do it, for I am spoiled by the creature comforts. Thanks for the links! It looks beautiful!!! I’m so glad you and hubby are enjoying such a beautiful part of the world and relaxing! Enjoy, my friend!!! When I read your posts, I frequently learn something new and interesting. Now imagine this. Because, I am fearful of driving in a foreign country, I will on occasion go for the added expense of hiring a driver to take me to some popular tourist spots. This one time I was in Sicily where the driver started driving right into traffic coming from the opposite direction. The cars coming in our direction were quickly swerving to the left and to the right. The driver must have loved my panic as I am crossing my self with a bunch of Hail Marys. When he dropped us off, I didn’t pay him the typical tip as I had been in fear for my life. Imagine my surprise as I’m detailing my woes over a stiff drink to the solicitous concierge,as I was told that the driver was doing what was legal. It turns out that these professional drivers have marked cars where he/ she can drive into incoming traffic. Italy (and Sicily as well?) 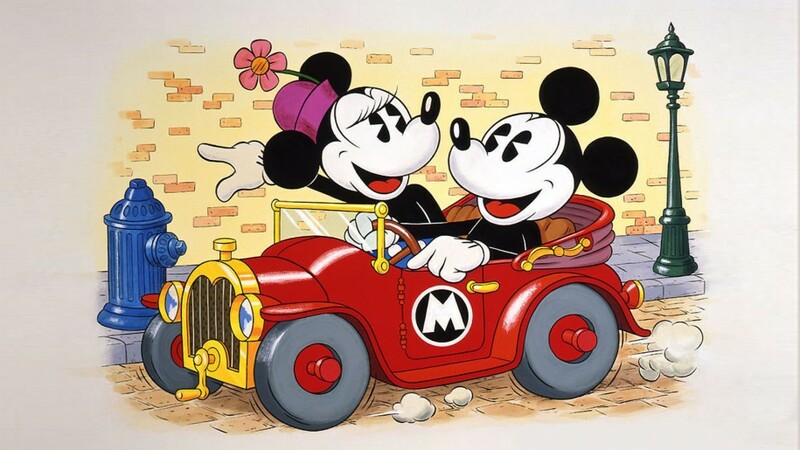 is famous for crazy drivers and a lack of coherent rules of the road! OH MY!!! I would have likely told him to pull over, that I would walk! Imagine, though, driving in Sicily and having to constantly be on the lookout for those ‘specially marked cars’! I wonder what their accident rate is there, and how much auto insurance costs? It’s crazy enough here on I-75 at 5:00 p.m.! I’m sure you were more than ready for that stiff drink! Fun story … it’s so fun to look back on those things and laugh, once they are in the past. Hugs!!! First of all, Sicily in smack-dab in the middle of the Mediterranean. It has been invaded by Greeks, Romans, Moors, Normans, Germans, British, Americans, and just about every other would-be power in the region. Each time, Sicilians retreated to their hilltop sanctuaries. There was little to do up there except drink homemade wine and make babies. Anyone familiar with Sicilian culture can tell you that being cooped-up with Sicilian women and children for any length of time would drive any sane man crazy. So, to escape the madness, they began meeting secretly at night and eventually organized themselves into the Cosa Nostra (a.k.a the Mafia). But, Italian politicians were in league (and sometimes in bed) with Sicilian women and children and they brought the weight of the legal system down hard on the Cosa Nostra. Fleeing the tyranny, many Sicilian men escaped to the U.S. where they flourished cooking pizza, merchandising fresh fruits and vegetables, selling homemade wine during Prohibition, and making movies like The Godfather. Unfortunately, this success was noticed by the Sicilian women and children who tracked down their men in America. These Sicilian-American men went crazy once more, and some returned to the Old Country where they aimlessly drive the mountainous roads drunk on “Dago Red” to this very day. Oh, I have… a sci-fi novel and several short stories. Good effort… I’m just a little dense sometimes – lol! Great information and history of driving on the left side versus right side of the road. Thank you for sharing, Robert!!! Easy for you, maybe, but I have visions of wanting to keep moving back over to the right, into my comfort zone, and then CRASH! ping. plonk. Cheers Jamie!!! I just LOVED this comment, Keith!!! I could picture this happening to me! Like you, I have never had the opportunity (?) to drive on the left, but am pretty sure I would find myself sorely tempted to get back over on the ‘right’ side! Thank you for this comment, for it was my single laugh of the night!!! Funny Keith! Years ago, when I lived in Canada, I returned to Uk for a funeral and rented a car. Having negotiated most of the fast road conditions without incident and 90 mile an hour driving (just to keep up), I managed to back up just a little too far on a three point turn and knocked down an entire section of wooden fencing ( which was probably ready to fall anyway). I had a real tongue lashing from the owner, complete with every possible swear word ever recorded in the English language! Amazing info … worth a read!! Sharing … very interesting and educational. … and quite enjoyable at that! Please, stop by! Thank you!!! It was fun to research! Fascinating! When I visited England a few years ago I found driving on the left difficult at first, but it started to become easier — just about the time we left! But it is strange that Canada drives on the right and not the left — being a British Colony for so many years! Fun stuff!!! The real challenges are the round-abouts and the busy city streets. Those gave me nightmares for days afterwords! Heck, the round-abouts here give me grief! Not long ago I went round 3-4 times before I figured out where to get off! But then, that was back before my eye surgery when I really shouldn’t have even been driving! Hi Hugh, Yes, UK driving is a nightmare (and I live in the UK). Roundabouts are often only indicated by painted signs in the road and prolific everywhere. People drive very fast around them, so split second decisions have to be made to enter the milieu! It is certainly stressful, even for Brits! Hey Jacqueline!!! Long time no see … it’s great to see you! Glad you enjoyed the post … I must drop by your place soon. Hugs!